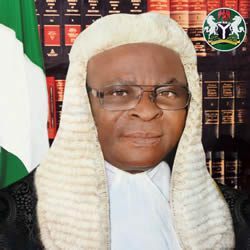 Chief Justice of Nigeria Walter Samuel Nkanu Onnoghen in open court today at the Supreme Court advised lawyers to stop the use of Miss/Mrs/Ms for female lawyers appearing in court. That Esq should rather be for announcing apperance with no other title. This came about in two cases where female lawyers announced thier presence in court and added Mrs to it. The Hon. Chief Justice also advised that where there are more than one person appearing, without title there should be introductory appellation- Messr wether female or male. But when only one person, name the person and use Esq whether female or male. Renowned professor of Law, Prof. Ernest Ojukwu, SAN applauds the bold opinion of the CJN on his decision that the use of Miss/Mrs should not be used in court. “This opinion is in accord with human rights. I have advised judges in the past that insisting that women should indicate if they are Miss, Mrs or Ms is discriminatory and debasing especially in the way the judges ask the questions”, Prof said.